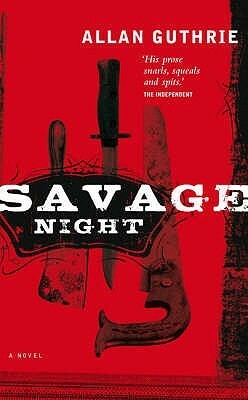 I recently finished reading Savage Night, the 2008 crime fiction/noir thriller novel by Allan Guthrie. And sweet baby Satan on a Savoy, what a novel it was. Take two families, add some revenge, toss in a handful of cold blooded violence and a twist of dark humour, and you have a book that asks the question; how much blood would you spill to avenge those you love? On one side of this bloody feud is Andy Park; ex(?) con, and haemophobic, vaguely psychotic patriarch of a family that considers casual violence to be the norm. On the other side is Tommy Savage, a man made wealthy off years of working shady deals, and with more than a few skeletons in his closet. When the two families clash, violence and bloodshed ensues, and no one is going to walk away unscathed. What begins as a simple case of blackmail – and in Park’s case, a chance to get even with the man responsible for the failing care of his brain damaged wife – soon turns into something infinitely more violent than either family could have imagined. After a money exchange goes wrong, and costs the life of someone Park holds dear, his motivations quickly change from blackmail to revenge. What follows is a sick, twisted series of events, each one more shocking and – as the title suggests – savage than the last, and soon both families find themselves in increasingly dangerous situations where it’s unclear who will survive, and who will join the ever growing number of bodies piling up in the wake of such brutality. The tables turn more than once in this novel, and I found myself unable to predict anything that was coming next. Guthrie’s penchant for intrigue kept this reader on her toes, and I couldn’t put the book down. His writing style is concise and direct, and the plot, while not overly complex, is written in a way that makes you feel as if this is the first revenge story you’ve ever read. His characters were cleverly written, certainly believable and mostly all detestable, but in a way that didn’t detract from Guthrie’s writing in the slightest. He is a talented writer, and Savage Night is definitely worth the read. The story is entertaining, the writing is clear and the ending is vaguely ambiguous. This book gets a solid 4 out of 5 for me, and I highly recommend reading it.